©Estate of Zoltan Sepeshy. Photograph by R.H. Hensleigh..
Zoltan Sepeshy believed that artists had an important place in society: “Art is a vital and growing experience. It heightens, revitalizes, and makes secure the accidental perceptions and enjoyments that men find even in their ordinary activities…This is the world that not all men can see. This is the realm that one must open to others.” Sepeshy’s personal vision was honed through classical training at the gymnasium in his birth town of Kassa, Hungary (now Kosice, Czech Republic), and through work for a Masters degree at the National Academy of Art and the Academy of Art Teachers in Budapest. He pursued further studies in Vienna and Paris, and traveled in Germany, Italy and France, before he arrived in the United States in 1921 at the age of twenty-three. Appointed Resident Artist at Cranbrook Academy of Art in 1932, Sepeshy combined a successful professional career with teaching and administrative service (Director of the Academy from 1947-1959 and its President from 1959 to 1966). Sepeshy painted the world around him, transforming industrial scenes, landscapes, cityscapes, and scenes of mundane human activity into compositions. He completed much large-scale work with murals on themes of transportation (1920s) and Michigan history (1930s and 1940s). But most often, he worked at “easel-scale” in the medium he seemed to love best, egg tempera painting. Sepeshy’s Rock Garden shares the luminous color and meticulously constructed surface for which the artist was known. But this painting is also a rare instance where Sepeshy’s inspiration seems equally based on outer and inner vision . Before us rises a collection of boulders, blossoms, and triangular leaf-tree shapes that stretch almost vertically to a thin strip of dark blue “sky” at the top. This differs from traditional domestic rock gardens, shaped by human design. Here the setting is rougher, more mysterious. Details are elusive. Vibrantly colored blossoms float stemless across the center top of the picture. Rocks bulk forward with no suggestion of a central light source or coherent earth structure. The angle of view suggests that we look across this segment of nature from a position lying on the ground, where small things loom large, and we can marvel at things that would pass unattended from a standing pose. The colors have a particular intensity, which magnifies the sense of inner vision, of seeing beyond what is usually the surface of the world. These effects spring from Sepeshy’s meticulous tempera painting process, which was inherently meditative. 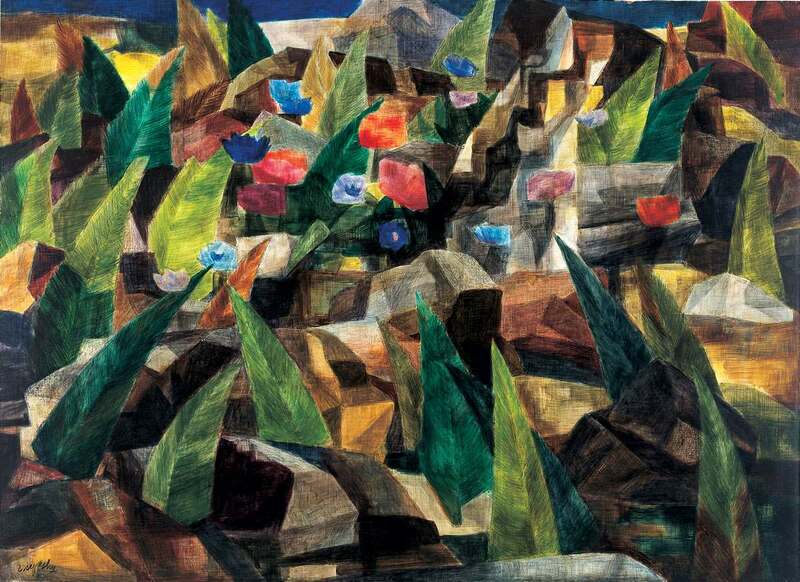 Based on a preparatory full-scale master drawing, Rock Garden is painted on a Masonite panel, prepared with glue sizing, and eleven coats of white primer, with the image built by applying thin layers of color with a variety of flat- and round­ shaped brushes (mostly sable, though long-bristled hog’s hair oil brushes might be used in underpainting, and a toothbrush might be used in areas where the artist wanted a group of same-width evenly-spaced lines). Generally, Sepeshy relied on the white of his primed ground to provide an inner glow to his works, using no additional white pigment. In Rock Garden, several patches of light gray add to the rich visual counterpoint of vivid light and dark greens, blues, reds, oranges, and browns, which keeps the viewer’s eye moving around the surface. Rock Garden’s viewers can revel in the magical ways with which Sepeshy’s brush and paint re-present this scene as an assembly of shapes and colors, and participate in the artist’s “heightening and revitalizing” of this rocky place. This eerily evocative work provides a rare glimpse into the rarely shared inner vision of a gifted humanist painter-educator.